WW2 German Luftwaffe Wehrmacht Bunker Warning Sign "AUSGANG" – VERY RARE!! WW2 German Italian French Swiss Equipment – DATA PLATE #27 – VERY NICE! WW2 German Italian French Swiss Equipment – DATA PLATE #14 – VERY NICE! WW2 German Italian French Swiss Equipment – DATA PLATE #23 – VERY NICE! WW2 German Italian French Swiss Equipment – DATA PLATE #29 – VERY NICE! WW2 German Italian French Swiss Equipment – DATA PLATE #21 – VERY NICE! WW2 German Italian French Swiss Equipment – DATA PLATE #5 – VERY NICE! 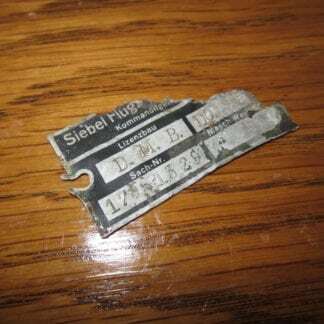 WW2 German Luftwaffe Data Plate – 100% ORIGINAL – Do17 P Reconnaissance – RARE! WW2 German Italian French Swiss Equipment – DATA PLATE #13 – VERY NICE! WW2 German Italian French Swiss Equipment – DATA PLATE #19 – VERY NICE! WW2 German Italian French Swiss Equipment – DATA PLATE #3 – VERY NICE! WW2 German Luftwaffe Wing Cooler Data Plate – Me109 – RARE!! WW2 German Italian French Swiss Equipment – DATA PLATE #26 – VERY NICE!